JASON KRAVITS in Off the Top! A once in a lifetime show, every show. One man, no plan! 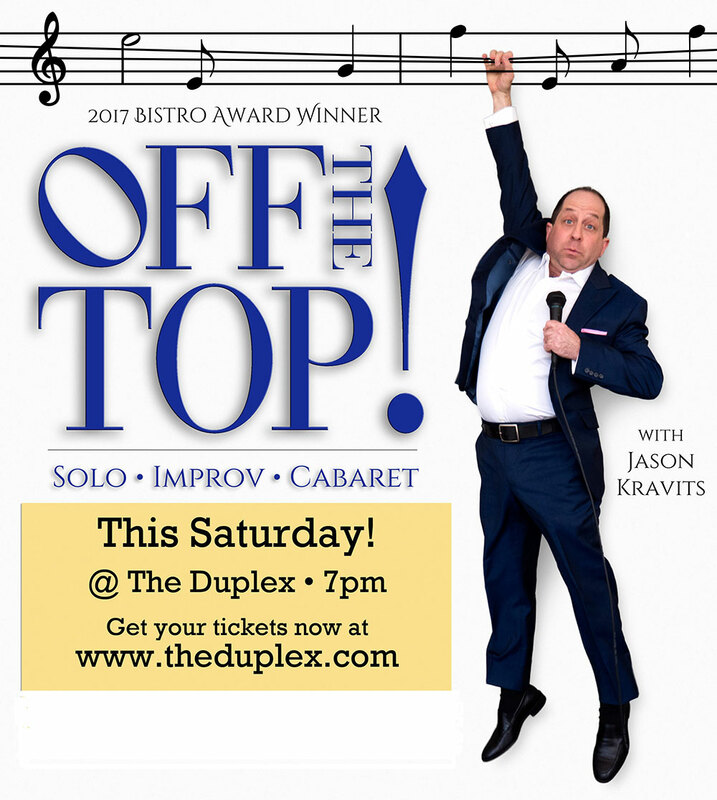 TV and Broadway veteran Jason Kravits (Kimmy Schmidt, The Drowsy Chaperone), invents an entire evening of cabaret from scratch….music, lyrics, stories, characters…all based on your suggestions. With amazing guest stars, straight from Broadway. Improv, music and comedy…without a net! TUCKER plays keys; GOLDEN loses them. TUCKER produces songs; GOLDEN produces gas. TUCKER has the voice of an angel; GOLDEN has the voice of a 7-foot tall man in a dress! Together, they’re TWO TUCKERS! For TUCKER it’s his name; for GOLDEN it’s her game (anatomical origami). TWO TUCKERS will feature TWO SPECIAL GUESTS — singer-songwriter ARIANA GATES and comedian DAVE MIZZONI. 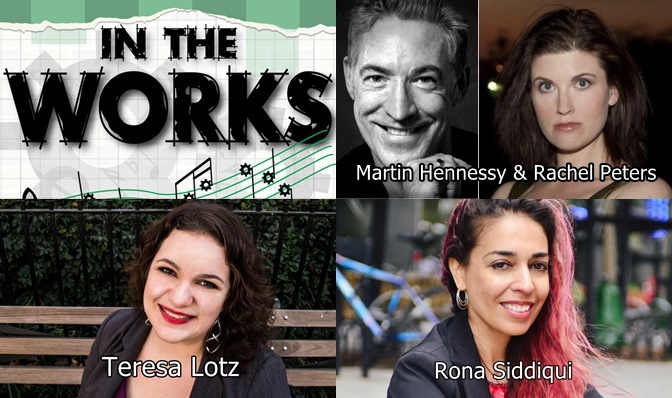 Honeck-Moss Productions is proud to present “In The Works.” This exciting series is in it’s second season was conceived as an opportunity for composers to try out new work in front of an audience and see how it plays in a supportive environment. It is also an opportunity to create community among the composers and their performers. In The Works is presented monthly and feature three composers or composer teams, each presenting about 20 minutes of new material. This month, Sunday March 25th at 9:30pm features the works of composers: Martin Hennessy & Rachel Peters, Teresa Lotz, and Rona Siddiqui… Hosted by: Thomas Honeck. With Performances by: Dana Aber, Cathy Ang, Maybe Burke, Meredith Lustig, Kyle Oliver, Emma Orme and others. Martin Hennessy is an award-winning composer of art song, chamber music and opera. His music has been performed by New York City Opera’s VOX Series, American Opera Projects and the Guggenheim Works and Process Series. In addition to awards from American Music Center, New Dramatists and San Francisco Song Festival, he has been honored with Copland House and Millay Colony residencies and commissions from the Estate Project for Artists with AIDS and the Five Boroughs Music Festival. His opera A Letter to East 11th Street (libretto: Mark Campbell) won the 2014 Domenic J. Pellicciotti Opera Composition Prize and was premiered by the Crane Opera Ensemble at SUNY Potsdam. As winner of the 2016 University of Maryland Opera Competition he was commissioned to compose an adaptation of Oscar Wilde’s The Young King with librettist Tom Rowan, which was premiered in February of 2017 by Maryland Opera Studio. His new song contribution to the AIDS Quilt Song Book was premiered this December at National Sawdust. Recordings can be found on Newport, Albany, GRP and Affetto. Rachel Peters writes all manner of works for the stage. Operas include Rootabaga Country (Sarasota Opera), The Wild Beast of the Bungalow (Center for Contemporary Opera),Companionship (Fort Worth Opera, Manhattan School of Music), and Pie, Pith, and Palette (The Atlanta Opera). Concert works include Ethel Smyth Plays Golf in Limbo(Semperoper Dresden) and Fronds: The Wisdom of Fanny Fern (Walt Whitman Project). Musicals include Only Children, Tiny Feats of Cowardice (NYC Fringe), Tomato Red, andOctopus Heart. Scores for plays include the critically acclaimed Stretch (a fantasia) (New Georges) and Tania in the Getaway Van (FleaTheater) by Susan Bernfield, andTransatlantic (Alabama Shakespeare Festival) by John Walch. Songs performed at Lincoln Center, National Opera Center, Symphony Space, and as part of The AIDS Quilt Songbook. Fellowships/residencies: New Dramatists Composer-Librettist Studio, American Opera Projects, John Duffy Institute, Kimmel Harding Nelson Center, Yaddo, Brush Creek Arts.